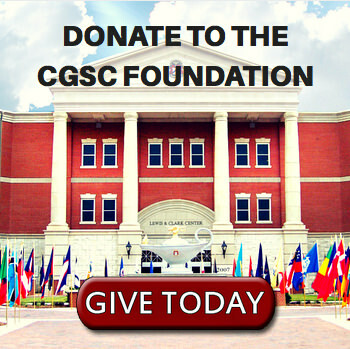 119 International Students receive honors from CGSC | Command and General Staff College Foundation, Inc.
(ArmyU Public Affairs) In preparation for the Command and General Staff College graduation on June 15, international military students received their International Graduate Badges in a ceremony June 14, 2018, at the Lewis and Clark Center. Netherlands Major Rene Berendsen, International Military Student Chief of Staff for the Command and General Staff Officers Course Class 2018, proudly proclaimed that 119 international students started the course last summer and 119 graduated this week. Majors Stefano Catania, Italy (left), and Rene Berendsen, Netherlands, present the International Military Student Class of 2018 gift to Brig. Gen. Scott Efflandt during the International Military Student Badge Ceremony June 14. 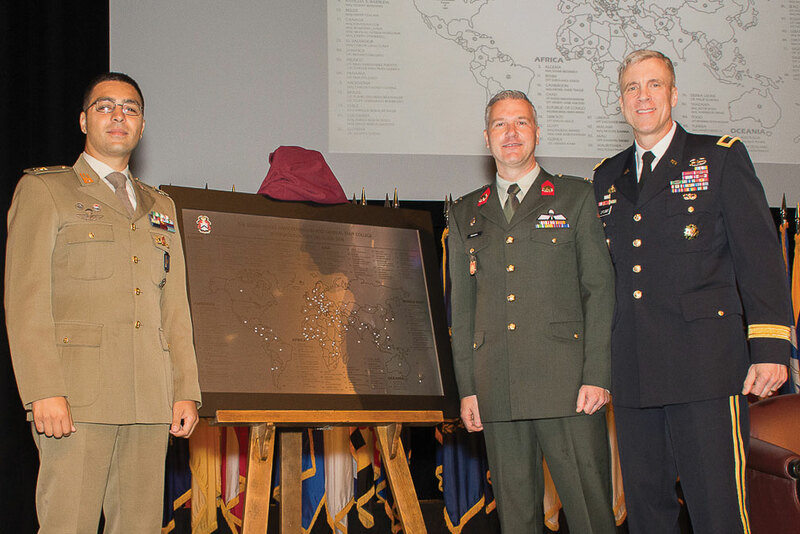 The gift is a map showing the names and countries of the 119 international students graduating from Command and General Staff Officers Course 2018. 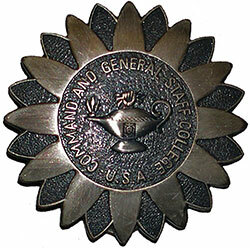 The International Officer Badge was designed and produced in its current form in 1964. The Leavenworth Lamp is the central theme and is surrounded by 12 bright and 12 darker sunflower petals, signifying the 12 months of day and night the officers spend earning their CGSC diploma in Kansas. 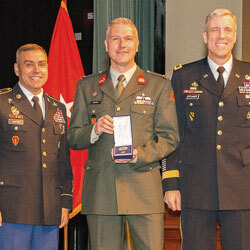 In addition to awarding the badges, winners of two international awards were announced during the ceremony. Maj. Jason Tinsley of New Zealand will receive the General Dwight D. Eisenhower Award recognizing him as the top international graduate for this year’s class. Maj. Joseph O’Donnell of Canada will receive the Major General Hans Schlup Award recognizing him as the student who best fostered international relationships during the class. The Hans Schlup Award is named in honor of a Swiss general who graduated from the course in 1978. Brig. Gen. Scott Efflandt, provost of the Army University and deputy commandant of the Command and General Staff College, spoke at the ceremony thanking the students, the sponsors who supported them throughout the year and the spouses. The sponsors, he said, opened their homes and hearts and most importantly, opened a bridge to greater understanding between two cultures. The spouses are the rock of all armies, said Efflandt. Efflandt also said that a key part of the success of the Command and General College is due to the international students. “Your participation makes this college better, and makes the other officer students in the college better. 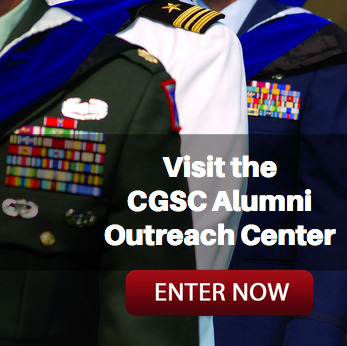 You all are an essential part of the magic of the Command and General Staff College,” he said. Efflandt added that the badge the international graduates receive is cloaked with much symbolism. 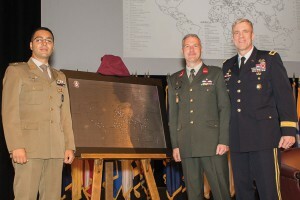 “It is a sign that embodies the finest military qualities; it represents a tradition of excellence that goes back to first staff colleges of Prussia; it represents a tradition that is validated here by our predecessors,” he said. 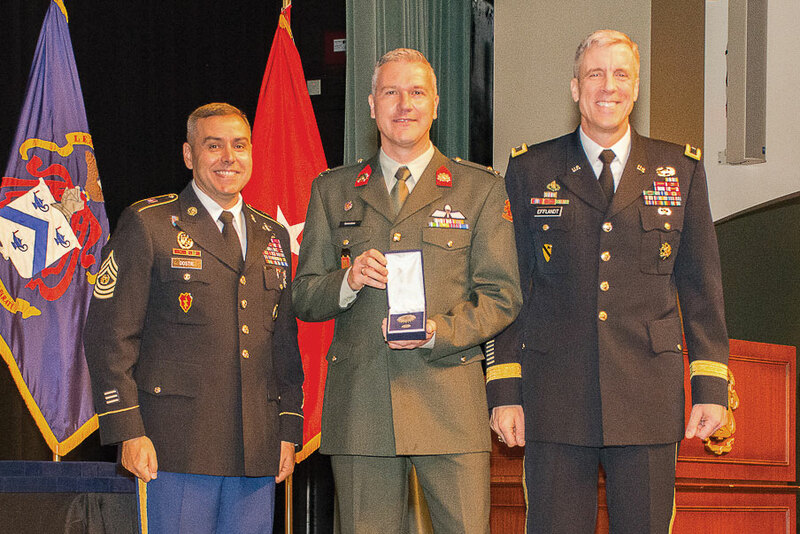 “It also comes with a burden that the person who wears this badge is expected to uphold the standards of Command and General Staff College graduates and wear it proudly,” said Efflandt. Berendsen reminded his classmates they will encounter each other again. “Remember this when you need shelter during exercises or deployments, or if you just want to share ideas or feedback or your thoughts. We are each other’s force multiplier,” said Berendsen. He said the friendships developed at CGSC contribute to an invincible network of professionals that is distributed around the world. The international students will join their classmates on June 15 when more than 1,100 officers graduate from the U.S. Army Command and General Staff Officer Course at 9 a.m on Fort Leavenworth’s Main Parade Field. The graduating class includes mid-career officers from all American military services, the international officers representing 91 countries, and 24 federal government civilian employees.